Riverine characteristics and adult demography inﬂuence female lake sturgeon (Acipenser fulvescens) spawning behavior, reproductive success, and ovarian quality. Abdul Razak, S.A. and K.T. Scribner. (2018) Ecological and ontogenetic components of larval lake sturgeon gut microbiota assembly, successional dynamics, and ecological evaluation of neutral community processes. J. Applied and Environmental Microbiology. In Press. Baker, Edward, A., and Kim T. Scribner. 2017. Evaluation of Lake Sturgeon Stocking and Estimation of Cohort-specific First-Year Survival in Black Lake, Michigan. Journal of Applied Ichthyology. 33: 892-897. Bauman, J., E. A. Baker, T. Marsh, and K. T. Scribner. 2015. Effects of rearing density on body size and survival of lake sturgeon (Acipenser fulvescens) free embryos. North American Journal of Aquaculture. 77: 444-448. Bauman, John M., Edward A. Baker, Terry L. Marsh and Kim T. Scribner. 2016. Body size and survival of hatchery- and wild-produced larvae as a function of feeding frequency and alternate food type. North American Journal of Aquaculture. 78: 136-144. Bott, K., K.T. Scribner, G. Kornely, M. Donofrio, and R.F. Elliott. 2009. Mixed-stock analysis of lake sturgeon harvest mixtures and from adjoining open waters of western Lake Michigan. North American Journal of Fisheries Management. 29: 1636-1643. Bussy, Ugo, Lydia Wassink, Kim T. Scribner and Weiming Li. 2017. Determination of cortisol in lake sturgeon (Acipenser fulvescens) eggs by liquid chromatography tandem mass spectrometry. J Chromatogrphy B. 1040: 162-168. Crossman, J.A., Patrick S. Forsythe, Edward A. Baker, K. T. Scribner. 2009. Over-winter survival of stocked age-0 lake sturgeon reared in natal and non-natal environments. Journal of Applied Ichthyology 25: 516-521. Crossman, J., K.T. Scribner, C. Davis, P. Forsythe, and E. Baker. 2011. Gamete and larval collection methods and hatchery rearing environments affect levels of genetic diversity in early life stages of lake sturgeon. Aquaculture 310: 312-324. Crossman, J.A., Patrick S. Forsythe, Edward A. Baker, K. T. Scribner. 2011. 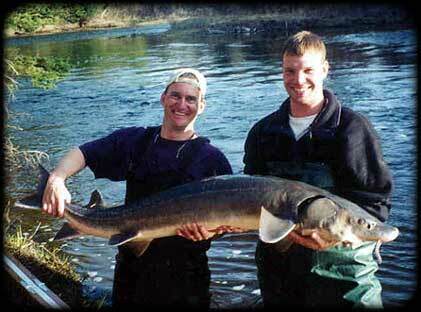 Experimental releases of lake sturgeon. Fisheries Management and Ecology. 18:132-144. Crossman, J.A., C.A. Davis, K.T. Scribner, P. S. Forsythe, and E.A. Baker. 2014. Survival and Growth of Lake Sturgeon During Early Life Stages as a Function of Rearing Environment. Transactions American Fisheries Society. 143:104-116. Crossman, J.A., K.T. Scribner, P.S. Forsythe, and E.A. Baker. 2017. Lethal and non-lethal effects of predation by native fish and an invasive crayfish on hatchery-reared age-0 lake sturgeon. Journal of Applied Ichthyology. In press. 2017;00:1–9. https://doi.org/10.1111/jai.13558. Dammerman, K.J., J.P. Steibel, and K. T. Scribner. 2015. Genetic and environmental components of phenotypic and behavioral trait variation during lake sturgeon (Acipenser fulvescens) early ontogeny. Environ. Biol. Fish. 98: 1659-1670. Dammerman, K.J., J.P. Steibel, K.T. Scribner. 2016. Increasing thermal regimes reveal cryptic genetic variation during early ontogenetic stages of lake sturgeon (Acipenser fulvescens). Evolutionary Applications. DOI: 10.1111/eva.12409. Dammerman, K., M. Webb, and K.T. Scribner. 2018. Riverine characteristics and adult demography influence female lake sturgeon (Acipenser fulvescens) spawning behavior, reproductive success, and ovarian quality. Canadian Journal of Fisheries and Aquatic Sciences. In Press. DeHaan, P., S.T. Libants, R.F. Elliott, and K.T. Scribner. 2006. Genetic population structure of remnant lake sturgeon populations in the upper Great Lakes basin. Trans. Amer. Fish. Soc. 135:1478-1492. Donofrio, Michael C., Kim T. Scribner, Edward A. Baker, Jeannette Kanefsky, Iyob Tsehaye, and Robert F. Elliott. 2018. Telemetry and Genetic Data Characterize Lake Sturgeon Breeding Ecology and Spawning Site Fidelity in Green Bay Rivers of Lake Michigan. Journal of Applied Ichthyology. 34: 302-313. Duong, Y., K.T. Scribner, J.A. Crossman, P. Forsythe, and E. Baker. 2011. Environmental and maternal effects on timing and duration of dispersal of larval lake sturgeon (Acipenser fulvescens). Canadian J. Fisheries and Aquatic Sciences. 68: 643-654. Duong, Y., K.T. Scribner, J.A. Crossman, P. Forsythe, and E. Baker. 2011. Relative loss of larval lake sturgeon among families during dispersal. Environmental Biology of Fishes. 91: 459-469. Duong, T.Y., K.T. Scribner, P. S. Forsythe , J.A. Crossman,, and E.A. Baker. 2013. Inter-annual variation in effective number of breeders and estimation of effective population size in long-lived iteroparous lake sturgeon (Acipenser fulvescens). Molecular Ecology. 22: 1282-1294. Forsythe, P.S., J.A. Crossman, N.M. Bello, E.A. Baker, and K.T. Scribner. 2012. Individual-based analyses reveal high repeatability in timing and location of reproduction in lake sturgeon. Canadian Journal of Fisheries and Aquatic Sciences. 69: 60-72. Forsythe, P.S., K.T. Scribner, J.A. Crossman, A. Ragavendran, C. Davis, E.A. Baker, and K.K. Smith. 2012..Environmental and lunar cues are predictive of timing of river entry and spawning site arrival in lake sturgeon. Journal of Fish Biology. 81: 35-53. Forsythe, P.S., K.T. Scribner, J.A. Crossman , A. Ragavendran, E.A. Baker. 2013. Experimental assessment of the magnitude and sources of lake sturgeon egg mortality in a natural stream setting. Transactions American Fisheries Society. 142: 1005-1011. Fujimoto, M., J.A. Crossman, K.T. Scribner, and T.L. Marsh. 2013. Microbial community assembly and succession on lake sturgeon egg surfaces as a function of simulated spawning stream flow rate. Microbial Ecology. 66:500–511. Fujimoto, M., B. Lovett, R. Angoshtari, P. Nirenburg, T.P. Loch, K. T. Scribner, and T. L. Marsh. 2017. Antagonistic interactions and biofilm forming capabilities among bacterial strains isolated from the egg surfaces of Lake Sturgeon (Acipenser fulvescens). Microbial Ecology. 75: 22-37. Hastings, R., J. Bauman, K.T. Scribner, and E. Baker. 2013. Post hatch dispersal distance of the lake sturgeon (Acipenser fulvescens) embryo in different substrate types. J. Applied Ichthyology. 29: 1208-1213. Homola, Jared J., Kim T. Scribner, Robert F. Elliott, Michael C. Donofrio, Jeannette Kanefsky, Kregg M. Smith. 2012. Genetically Derived Estimates of Contemporary Natural Straying Rates and Historical Gene Flow among Lake Sturgeon Populations. Transactions American Fisheries Society. 141:1374-1388. Homola, J. J., K. T. Scribner, E. A. Baker, and N. A. Auer. 2010. Genetic assessment of straying rates for wild and hatchery reared lake sturgeon (Acipenser fulvescens) in Lake Superior tributaries. Journal of Great Lakes Research 36:798-802. Jay, K.J., J. M. McGuire, and K.T. Scribner. 2018. Ecological conditions affect behavioral and morphological trait variability of Lake Sturgeon yolk-sac larvae. Journal of Applied Ichthyology. 34: 341-347. Pledger S., E. Baker and K.T. Scribner. 2013. Breeding return times and abundance in capture-recapture models. Biometrics. 69:991-1001. Tsehaye, I., T.O. Brenden, J.R. Bence, W. Liu, K.T. Scribner, J. Kanefsky, K. Bott, and R.F. Elliott. 2016. Combining genetics with age/length data to estimate consistent changes in year-class strength of spawning populations contributing to admixtures, with application to Lake Michigan lake sturgeon. Fisheries Research. 173: 236-249. Valentine, S., J. Bauman, and K.T. Scribner. 2017. Effects of alternative foods on body size and survival of larval lake sturgeon. North American Journal of Aquaculture. 79: 275-282. Waraniak, J. M., Blumstein, D., and K. T. Scribner. 2017. Barcoding PCR primers detect larval lake sturgeon (Acipenser fulvescens) in diets of piscine predators. Conservation Genetics Resources. 10(2): 259-268. Waraniak, J. M., S. A. Valentine, and K.T. Scribner. 2017. Effects of changes in alternative prey densities on predation of drifting larval Lake Sturgeon Acipenser fulvescens. J. Freshwater Ecology. 32: 619-632. Waraniak, J. M., Baker, E. A., and K.T. Scribner. 2018. Molecular diet analysis reveals predator-prey community dynamics and environmental factors affect predation of larval lake sturgeon (Acipenser fulvescens) in a natural system. J. Fish Biol. doi: 10.1111/jfb.13726. Welsh, A., B. May, C. Krueger, K.T. Scribner, R. Elliott, H. Quinlan. 2010. Genetic Guidelines for the Stocking of Lake Sturgeon (Acipenser fulvescens) in the Great Lakes Basin. Great Lakes Fishery Commission, Miscellaneous Publication. 2010-09. Dammerman, K., J.P. Steibol, and K.T. Scribner. Effects of parentage and microhabitat variation within adult-selected spawning sites on lake sturgeon (Acipenser fulvescens) growth during early life stages. Environmental Biology of Fishes. In review. Hegna, Jonathan, Kim T. Scribner, Edward Baker. Movement and habitat use characteristics of juvenile lake sturgeon in a small hydroelectric reservoir system. Canadian Journal of Fisheries and Aquatic Sciences. In review. Hegna, J., K.T. Scribner and E.A. Baker. Evaluation of Optimal Surgical Incision Placement, Closure Methods, and Transmitter Burden on Surgical Outcomes for Intracoelomic Transmitter Implantation in Age-0 Lake Sturgeon. Journal of Fisheries Research. In review. Hunter, R. D., Roseman, E.F., Sard, N.M., DeBruyne, R.L. and K.T. Scribner. Pedigree analysis describes spawning habitat use by lake sturgeon (Acipenser fulvescens). In review. McGuire, J.M., D. Bello-Deocampo, J. Bauman, E. Baker, and K.T. Scribner. Histological characterization of goanadal development of juvenile lake sturgeon (Acipenser fulvescens). Envir. Biol. Fish. In review. Riedy, Joseph J. and Kim T. Scribner. Experimental evidence for the role of evening light conditions to lake larval sturgeon predation by stream fish predators. Journal of Freshwater Ecology. In review. Walquist, R,. J. Bauman, T. Marsh, and K. Scribner. Effects of benthic macroinvertebrates on the body size and survival of Lake Sturgeon (Acipenser fulvescens) eggs and free embryos. J. Freshwater Ecology. In review. Pat DeHaan (2002). Demographic and Life History Characteristics of Remnant Lake Sturgeon Populations in the Upper Great Lakes Basin: Inferences Based on Genetic Analyses. Master’s Thesis, Michigan State University, East Lansing, Michigan. Kristin Bott (2006). Genetic analyses of dispersal, harvest mortality, and recruitment for remnant populations of lake sturgeon, Acipenser fulvescens, in open-water and riverine habitats of Lake Michigan. Master’s Thesis. Michigan State University, East Lansing, Michigan. James Crossman (2008). Evaluating Lake Sturgeon (Acipenser fulvescens) restoration programs in the Great Lakes: Effects of collection method, hatchery rearing environment, and age of stocking on genetic diversity, growth, survival,and predation. PhD Dissertation, Michigan State University, East Lansing, Michigan. Patrick Forsythe (2010). External correlates of migratory and spawning activity and egg deposition and mortality in lake sturgeon Acipenser fulvescens. PhD Dissertation, Department of Zoology, Michigan State University. East Lansing, MI. Yen Thuy Duong (2010). Effects of spawning behavior and environmental factors on adult reproductive ecology and larval dispersal of lake sturgeon (Acipenser fulvescens). PhD Dissertation, Department of Fish and Wildlife, Michigan State University, East Lansing, MI. Masa Fujimoto (2012). Microbial community succession on the Lake Sturgeon egg surface: mechanisms shaping the microbial community assemblage and the effect of microbes on host life history. PhD Dissertation, Michigan State University, East Lansing, Michigan. Kari Dammerman (2015). Extrinsic and intrinsic factors affecting adult reproductive biology and early life stage development of lake sturgeon. PhD Dissertation, Michigan State University, East Lansing, Michigan. John Bauman (2015). Investigations of aquaculture methodologies to enhance success of Great Lakes lake sturgeon streamside facilities. Master’s Thesis, Michigan State University, East Lansing, Michigan. Shairah Abdul Razak (2017). Biotic and Abiotic Factors Influence Formation and Ontogenic Dynamics of Molecularly Defined Gastro-Intestinal Microbial Communities in Lake Sturgeon (Acipenser Fulvescens) and Channel Catfish (Ictalurus Punctatus). PhD Dissertation, Michigan State University, East Lansing, Michigan. Justin Waraniak (2017). Barcoding, Metabarcoding, and Experimental Analyses of Community Dynamics and Environmental Conditions Affecting Predation of Larval Lake Sturgeon in the Black River, Michigan. Mater’s Thesis, Michigan State University, East Lansing, Michigan. Robert Hunter (2018). Assessing Reproductive Success of Lake Sturgeon (Acipenser fulvescens) Associated with Natural and Constructed Spawning Reefs in a Large River System Using Pedigree Analysis. Mater’s Thesis, Michigan State University, East Lansing, Michigan. Jonathan Hegna (current). Juvenile Lake Sturgeon Passage Behavior and Survival at Two Hydroelectric Dams in Northern Michigan. PhD Dissertation. Joseph Riedy (current). Environmental Influences on Lake Sturgeon Survival During Early Life States. PhD Dissertation. 2015 MSU research team: From left to right; Jonathan Hegna, John Bauman, Dillon Ross, Jenna Ruzich, Ryan Walquist, and Shaley Valentine. Not pictured: Adam Chastan, Justin Waraniak, and Garrett Johnson. The 2015 Black Lake research season began April 30th when Michigan State University (MSU) and Michigan Department of Natural Resources (MDNR) researchers captured six Lake Sturgeon ascending the Upper Black River. This was a later start compared to previous years, yet the adult sampling period continued into June with the last sighting of a sturgeon in the river being recorded on June 8th. A total of 248 adult Lake Sturgeon were captured throughout the spawning season, which includes 46 newly captured fish. The one day record of fish captured this year was 35 individuals. The largest fish captured this year was a 6 foot 3 inch female that weighed 133 pounds. In total there have been 1,037 unique individual Lake Sturgeon captured in the Upper Black River since 2001. Gametes were collected from spawning Lake Sturgeon and were transported to the Stream Side Rearing Facility for fertilization and rearing. In addition to raising eggs in the hatchery, wild larval Lake Sturgeon were captured as they drifted downstream. Previous studies conducted by MSU and MDNR researchers found that these wild larvae represent the best stock source genetically, so all captured larvae are brought back to the Streamside Facility in an effort to enhance survival. This year, larval drift sampling began on May 19th and ran until there were two consecutive unsuccessful capture nights, which this year was on July 5th. As a result of night sampling, researchers captured 1,723 wild dispersing larvae. This year, Lake Sturgeon raised at the Streamside Facility and utilized for stocking were all of wild origin. In addition, to enhance future management efforts, all 529 Lake Sturgeon released into the Black River were implanted with passive integrated transponder tags. All 500 Lake Sturgeon released into Mullett Lake and 53 released into the Sturgeon River were implanted with coded wire tags. At the end of the hatchery season Lake Sturgeon reached an average length over 7 inches prior to release which is larger than previous year’s release size. Larger growth can be attributed to improved feeding strategies developed through research activities conducted at the Black River Streamside Facility. Ongoing research involved identifying sources of early mortality in larvae, particularly those preyed upon by fish predators (such as Rock Bass). In addition to identifying sources of larval mortality in the wild, researchers continue to focus on identifying more efficient food types for hatchery-raised Lake Sturgeon as well as continue to investigate the downstream passage of juvenile Lake Sturgeon through hydroelectric facilities. 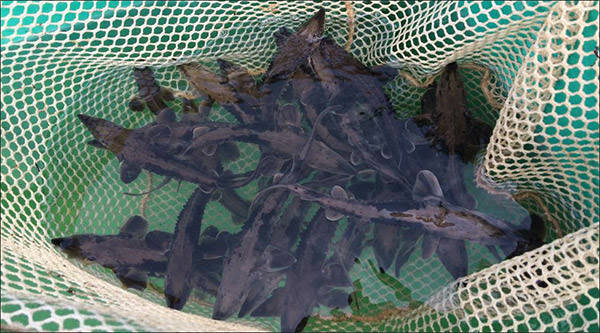 The Little Traverse Bay Band of Odawa Indians (LTBB) has stocked fall fingerling sturgeon in Burt Lake since 2013. The goal of the survey is to gather data on the survival, growth rates and other information for these stocked fish. The Burt Lake sturgeon assessment was conducted September 14 through October 5 and targeted both juvenile and adult sturgeon. The fish were checked for tags which showed if the sturgeon were wild (no tags) or stocked. The tags provide a history of when the fish were stocked and when they might have been caught in previous surveys. The wild fish were also tagged so that they can be followed in new surveys or when they are possibly harvested in the future. Sampling locations were randomly chosen throughout the entire lake. Three boats were used, including two tribal boats, and one DNR boat and crew. There were 63 unique sturgeon captured and 3 of these sturgeon were recaptured during this survey. 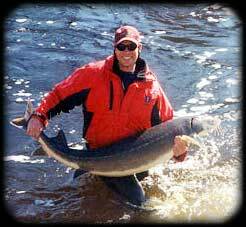 In addition, 7 of the captured sturgeon were tagged during the 2011 survey. Despite the smaller mesh size, the 2015 survey did not produce many small sturgeon and provided little evidence of strong natural or stocked juvenile recruitment. Very preliminary population projections estimate the sturgeon population of Burt Lake to be between 644 and 1535 sturgeon. Expanded numbers should be interpreted with caution due to the low numbers captured during the survey. 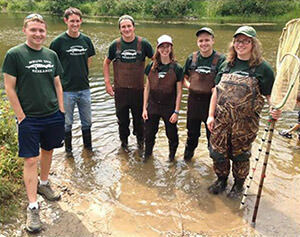 If you would like to volunteer to assist with sturgeon research, please contact or 231-625-2776.